Product Description: This night splint features a completely padded posterior shell preset to 10 degrees dorsiflexion, designed to provide passive flexion to help relieve the symptoms of plantar fasciitis or Achilles tendinitis. Its neutral design eliminates the need to order left or right. 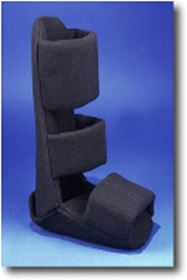 A foam toe wedge is provided for increased dorsi-flexion when indicated.